Please take note that for some languages we have a lot of strings that need to be approved by a Translation Editor. These translations aren’t pulled automatically so you should follow the instructions from here to manually download them. 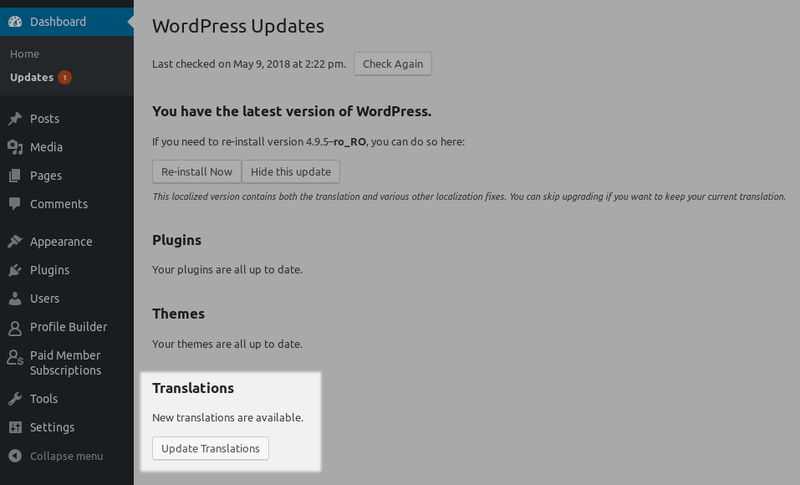 Translations are handled through the WordPress Translate website so usually the files should be updated when you update WordPress or your theme. 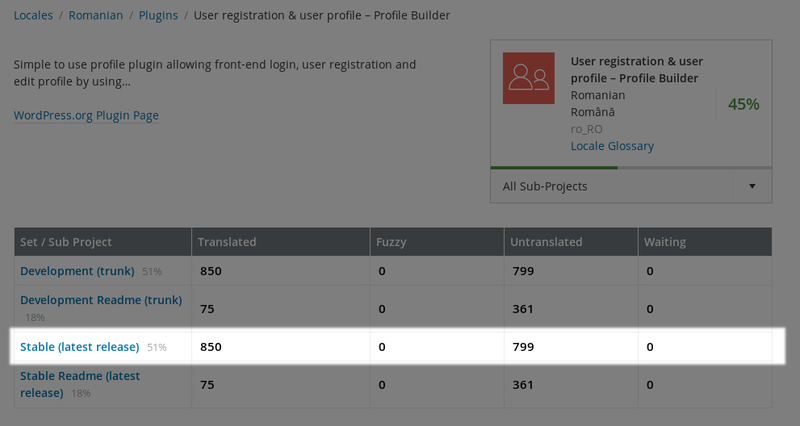 If you just installed a new language, you can also go to Dashboard -> Updates, where at the bottom you will find a Translations section in which there’s a button that will allow you to manually update the translations. 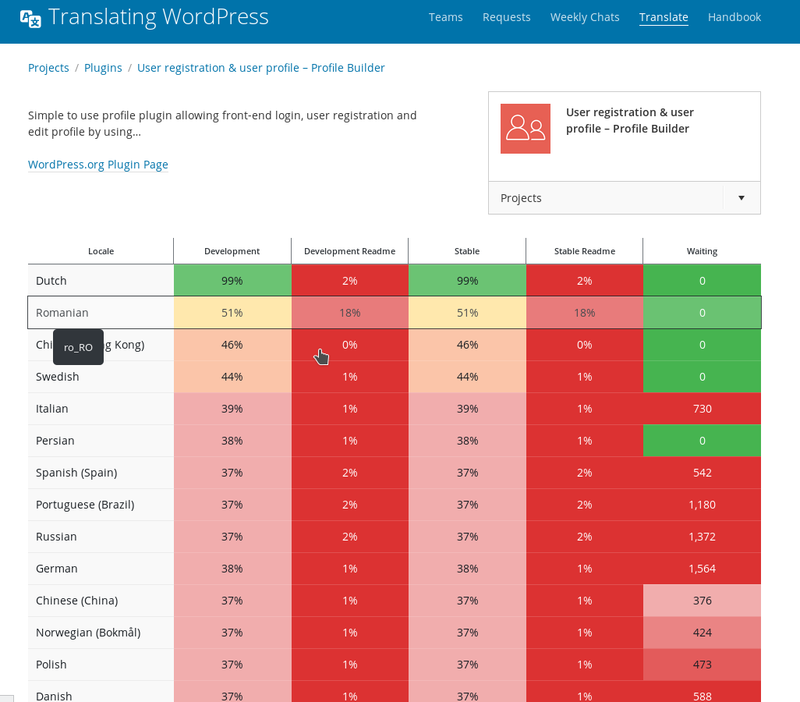 For more in-depth information about the WordPress Translation Environment please refer to their documentation. To add a missing translation go to this page, click on your language and then click on Stable (latest release). Your string will be added to the waiting list and will need to be approved by a Translation Editor. Fortunately, you can benefit from the added translation without waiting for approval by manually downloading and updating your translation files. Strings that are marked with yellow (with the waiting status) aren’t pulled automatically when you update your translation files. To use these strings, you will need to manually download and update your translation files. To do this, first go to your desired language and make sure the filter is set to Current/waiting/fuzzy + untranslated (All) without other options (this is the default). Then scroll to the bottom and where it says All Current select Only matching the filter then using the Export option, export the translations in the Portable Object Message Catalog (.po) and Machine Object Message Catalog (.mo) formats. Where ro_RO is the locale of your selected language. For example, if you would like to download the Dutch translation files you would need to add nl_NL instead of ro_RO. You can check out the locales for every language on this page. After you renamed the two files, you need to FTP into your server, navigate to the wp-content/languages/plugins directory and then upload the 2 files you downloaded. The strings should be translated in the front-end afterwards.